This plan recognizes and respects the historical and architectural heritage of Payette and encourages the rehabilitation of its historic buildings. The city center possesses numerous historic buildings and this visual character sets Payette apart from its surrounding cities. These buildings form a special asset that can give the city a unique identity and a quality not easily duplicated. Table 1 and Figure 20 on pages 16 and 17 identify 79 historic structures located within the study area. The majority of these are located from Center Avenue to 3rd Avenue North along 8th Street. Seven of these buildings are listed on the National Register of Historic Places. The city’s substantial architectural heritage was established from 1890 through the 1920’s creating a rich mixture of architectural style and craftsmanship that is predominant today and provides a common theme element from which to expand. See page 15 for additional information. 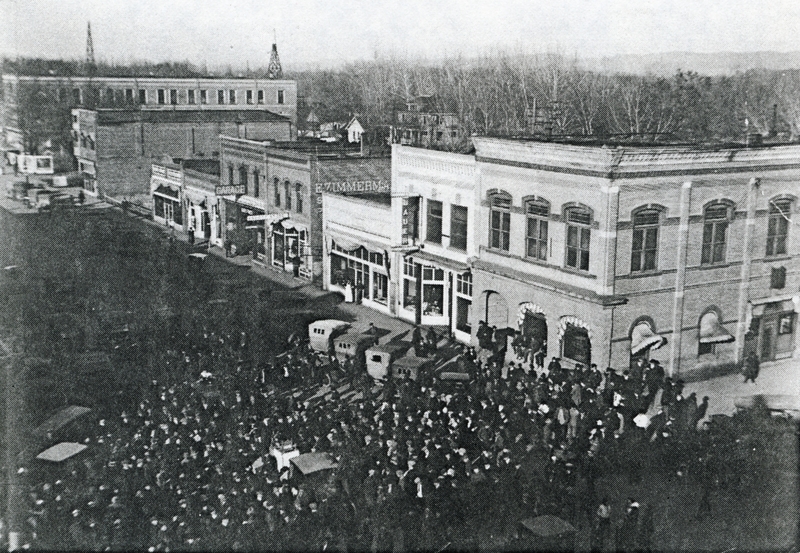 The main thrust of this planning effort is to revitalize Payette’s historic buildings and reverse the decline of its commercial center. To accomplish this it is recommended that historic buildings be rehabilitated to recapture the warmth and beauty they once had. Presently, a number of historic buildings such as the Senior Citizen Center (A.B. Moss #11) and Sandy’s (Keith’s #40) present this image, but many other building facades have been altered over the years and need to be rehabilitated in a sympathetic manner to reinforce Payette’s historic character. Enhancement of the original storefront is one of the most dramatic ways of achieving visible results and improving the building’s patronage. 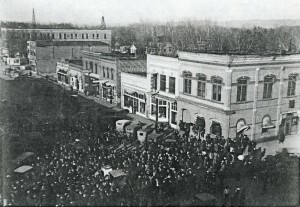 Frequently, limited maintenance or modernization of the first floor has reduced the appeal of many of Payette’s downtown buildings. The key to an improved storefront is to respect the entire building facade, not just the shop level. 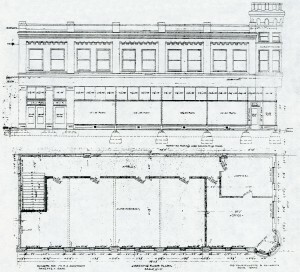 To demonstrate Payette’s potential for rehabilitation, the fold-out illustrates the existing condition and proposed rehabilitation of the east elevations of Main Street’s 100 Block North. Building rehabilitation includes improved storefronts, sympathetic painting, awnings, and tasteful signing. Making old buildings more functional and enhancing their storefronts and unique details is the first step in revitalizing downtown Payette. The benefits of rehabilitation are many and include a favorable image, more patronage, and better economic return. 1920 Doughboy Statue Ceremony. 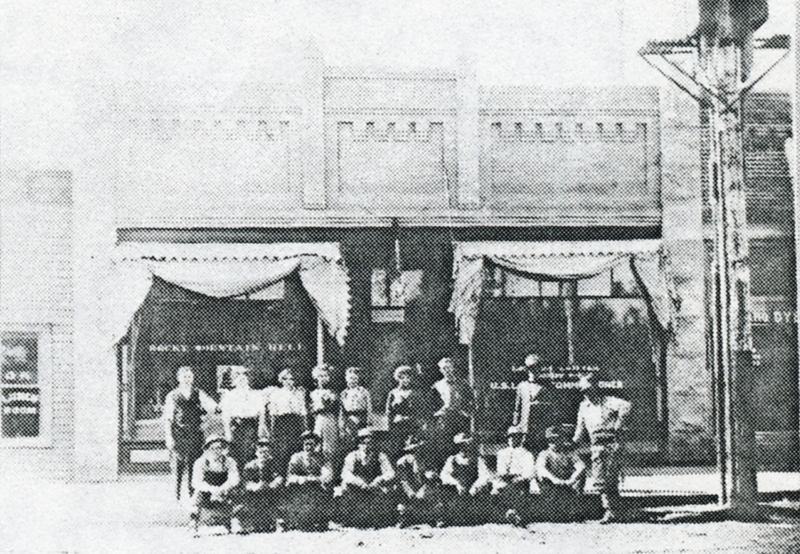 Excellent Historic Photo Detailing the Original Storefronts of Buildings on 8th Street between Center Avenue and 1st Avenue North. Sensitive rehabilitation starts with a review of historic photographs of the building, an understanding of its structural integrity, and a knowledge of the structure’s alterations over time. By enlisting the services of professionals, decisions can be made on how to best utilize all areas of the building, type of use, and desired tenants. Key decisions are also required on access into and through the building, new utility systems, and attention to maintaining or recapturing the building’s architectural character. Specific treatment, techniques, and rehabilitation methods are outlined in the Secretary of Interior’s Standards and Guidelines for Rehabilitation, which is available from the Idaho State Historical Society. This is of particular importance since rehabilitation establishes eligibility for investment tax credits if the work meets specific guidelines and is certified. 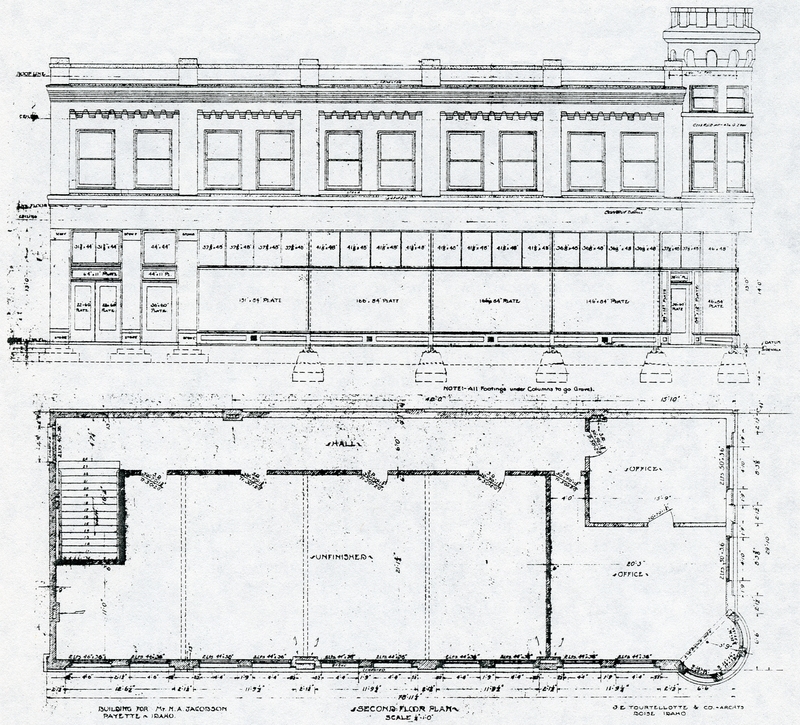 Architectural Drawings of North Elevation and Second Floor Plan of N. A. Jacobsen Building. Minor Improvements – This approach allows the owners to improve the facade at a minimum cost. The building is cleaned and repainted bringing out the structure’s architectural details, unsightly signs are removed, new fabric awning is installed, and awning and window graphics are added. In many cases, simply removing an earlier remodeling addition and applying new paint can create a whole new image for the structure. Rehabilitation – This approach requires a professional paint job that highlights the architectural details with contrasting colors. The shop storefront is returned to its original design, including recessed entry, wood door(s), appropriate window sizes, and a wood or tile kickplate. Also, new window and awning graphics are added, as well as a colorful fabric awning. This approach minimizes less attractive features and through paint and wooden storefront infill, it emphasizes the positive features at a modest cost. Major Rehabilitation – This level requires cleaning and painting the building, duplicating the, original storefront including clerestory windows, doors, kickplate and hardware, and duplicating any removed architectural details such as cornices, window caps, etc. As with the other options, good graphics and awnings are necessary. Such storefront reconstruction demands a high level of craftsmanship and materials, and has the highest cost. 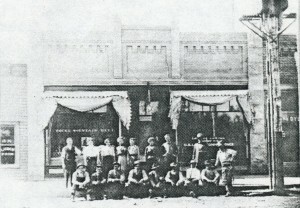 The results, however, are a first-class store-front with a facade close to its original condition. With all three options, visually appealing fabric awnings are used because they supply color and texture and serve as a shading device and sign backdrop. Awnings are historically appropriate, affordable, and easily noticeable by customers. In summary, it makes good business sense to maintain a favorable impression since most people naturally prefer to shop at an attractive store. The renovated building, good tenants and patronage will increase revenue and allow for a better economic return. Payette’s architectural assets will provide an attractive downtown setting for both local citizens and visitors. Implementation strategies for rehabilitation include setting up a commercial revolving loan fund, utilizing the IDA-ORE Main-Street Program, and taking advantage of the tax investment credit for certified rehabilitation projects for buildings listed on the National Register of Historic Places.